Head to iTunes today and grab your copy of Dreamworks Animation’s HOME! Then join the Twitter party tonight (6/26/15) at 7 EST. Watch the movie, tweet along, and win prizes!!! Good luck and enjoy the show!!! LOS ANGELES, CA – Celebrate family, friendship and fun in the surprise smash comedy hit of the year from the creators of How To Train Your Dragon and Shrek! In DreamWorks Animation’s HOME, Oh, a loveable misfit from another planet meets a girl named Tip. The two unlikely friends embark on the greatest journey of all time…the journey HOME. 20th Century Fox and DreamWorks Animation are pleased to release a NEW trailer for their highly anticipated film, HOME! Watch HOME stars Rihanna and Jim Parsons interview each other in an exclusive cast chat. Let this intergalactic 3D animation take you out of this world when it hits the big screen on March 27, 2015! Disclaimer- I received a copy of How to Train Your Dragon 2 Blu-Ray as part of the Fox Home Entertainment Insiders Blogger Program but all opinions are 100% my own. While you are waiting for How To Train Your Dragon 2 to arrive on DVD and Blu-Ray, check out these fun activity pages. Click on each one to view it larger and print it. Enjoy! 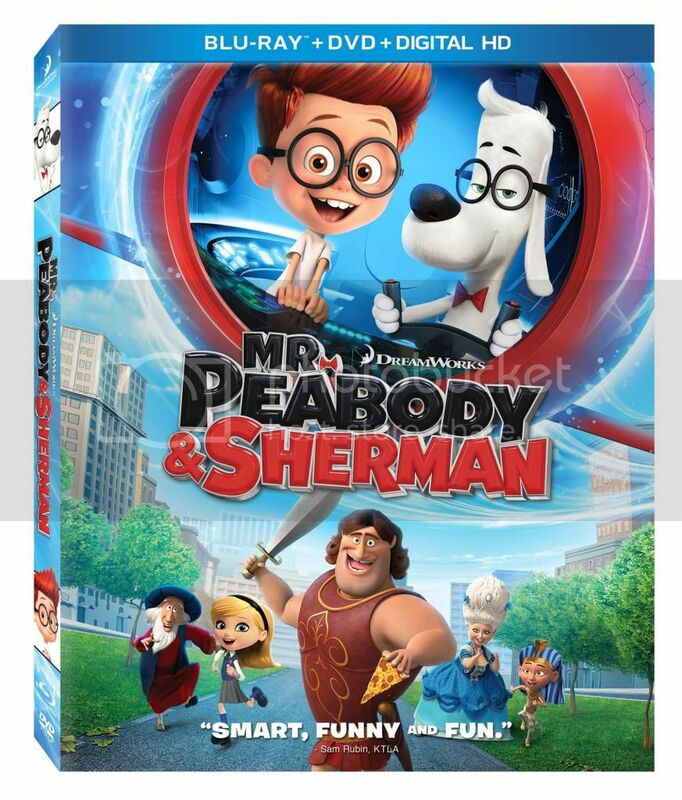 Disclaimer- I received a copy of Mr. Peabody and Sherman Blu-Ray as part of the Fox Home Entertainment Insiders Blogger Program but all opinions are 100% my own. Mr. Peabody and Sherman is coming to Blu-ray and DVD on October 14th but here are some great FREE printable activity sheets to enjoy while you’re waiting. Click on each image to be taken to a larger, printable version. Directed by Rob Minkoff (THE LION KING, STUART LITTLE) and from the team behind family favorite franchises THE CROODS and HOW TO TRAIN YOUR DRAGON, MR. PEABODY & SHERMANis “fun” and “fast moving” (A.O. Scott, The New York Times) and features hilarious performances from an incredible voice cast of popular stars including Ty Burrell, Ariel Winter, Stephen Colbert, Leslie Mann, Max Charles, Patrick Warburton and Allison Janney. Tour of the WABAC Machine – Mr. Peabody, himself, takes us on an in-depth tour of the WABAC machine. He explains what many of the WABAC’s knobs, buttons, and gizmos do. Exactly what is a Pneumatic Dressilator? A hemidemisemiquavatron? And, those windshield wiper controls…how exactly do they help while speeding through the space-time continuum? Mr. Peabody explains it all! Time Travel: Mad Science – We talk to real physicists Kenneth Wharton and Anthony Aguirre to find out if there is any possibility of time travel, and if so, how it would work. We explore the two time travel theories of the Block Universe and the Multi-Verse. We also learn why scientists think only forward time travel is possible, and how Einstein’s Theory of Relativity still determines how scientists imagine the possibilities of time travel. THE PENGUINS OF MADAGASCAR Hits Theaters Everywhere on November 26, 2014! 20th Century Fox and DreamWorks Animation have just released a NEW clip and poster for THE PENGUINS OF MADAGASCAR, featuring everyone’s favorite, mysterious birds! Discover the secrets of the most entertaining and mysterious birds in the global espionage game: Skipper, Kowalski, Rico and Private now must join forces with the chic spy organization, the North Wind, led by Agent Classified (we could tell you his name, but then you know), voiced by Benedict Cumberbatch to stop the villainous Dr. Octavius Brine, voiced by John Malkovich, from taking over the world. 20th Century Fox and DreamWorks Animation Trailer For HOME! Featuring the voices of Jim Parsons, Rihanna, Steve Martin, and Jennifer Lopez! 20th Century Fox and DreamWorks Animation have just released the FIRST trailer for their highly anticipated film, HOME! Get intergalactic when this 3D comedy, featuring the voices of Jim Parsons, Rihanna, Steve Martin, and Jennifer Lopez, hits the big screen on March 27, 2015!